Charming villa with spectacular sea views. Twenty minutes from the centre of Barcelona in a coastal village. The villa is just a 5 minute walk to the beach, Marina and train station. Relax on the beach after a day of sightseeing in Barcelona in the many "chiringuitos" (Spanish beach bars) where, during the summer months you can taste local seafood and tapas for a very reasonable price. Just up the road (5 minute bus ride), you will find the charming wine village of Alella, famous for its Marfil wines. The town of El Masnou is known locally for its Marine and beach nearby Alella, a scenic wine-producing village with its own "denomination" and many fine buildings. Allella is right on the coast, just up from El Masnou, about 20 kms north of Barcelona. Alella and Masnou would be listed on any decent map of the area. Masnou has commuter trains in to the center of Barcelona every 15 min, a fun train ride which runs along the coast, with views of the beaches for much of the 20 minutes the trip lasts. You can also drive into Barcelona in about 20 minutes from the coastal highway, the C-32 from Masnou. 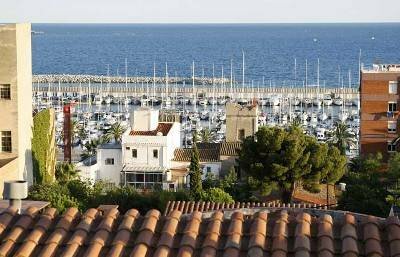 Masnou is also important for the quality of its beaches, the good terraced restaurants on its pleasure port, the old world charm of the town center, and the good supermarkets just outside of town. Cheap flights are available through Easy jet from London to Barcelona Prat airport which is just over half an hour by car or from Ryan Air to Girona airport which is approximately an 45min away by car. Below are numbers for cheap car hire when flying to Barcelona airport Terminal B. Prices: Starting from 25 euros per person per day, 120 euros to 180 per apartment per day. The villa has one double room, with a large double bed (160 x 200). Has a triple room with 1 single bed and a double bed (135x 190) In the living room ith has So the maximum capacity will be for 7 persons.